Larger. Higher test scores. More diverse. Those are the buzzwords around this year’s freshman class at YSU. Preliminary numbers show a 17 percent increase in freshmen on campus this fall compared to last year, from 1,821 to 2,125. Their average ACT scores (21.15) and high school GPAs (3.14) are the highest in the university’s history. They come from 423 high school (303 last year) and 53 Ohio counties (37 last year). Nearly 350 are from out of state (up 62 percent) and nearly 500 are multicultural students (up 47 percent). In addition, residence halls are at capacity at 1,383 (up from 1,143 last year) and the new Honors College has 162 freshmen (up from 96 last year). “We have made tremendous strides in the past year to recruit students with increased academic credentials and from an expanded geographic region,” President Jim Tressel said. President Jim Tressel at the State of the University in Kilcawley Center. 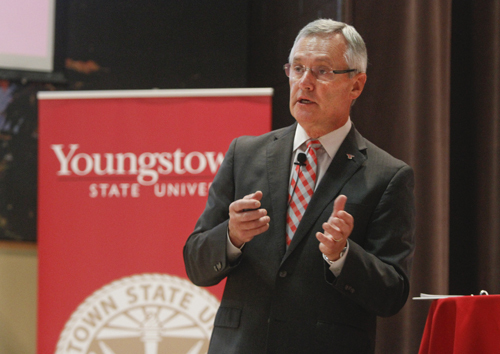 But in his State of the University address, Tressel said attracting more and higher quality students is not enough. The key is retaining those students and providing them the resources to be successful and to graduate in a timely fashion. “If we continue to attract more and retain more, we’ll be able to reach the goals we have in mind,” he said.